If you haven’t already, you should enter the Rafflecopter at the end of this page to win the grand prize! And did you notice the banner up top? Yes, there’s also a sale going on! You will get 20% off one pattern, 30% off two patterns, or 40% off three or more patterns. So much going on! It’s so nice to hear about your sewing memories and mentors! Please keep your comments coming! 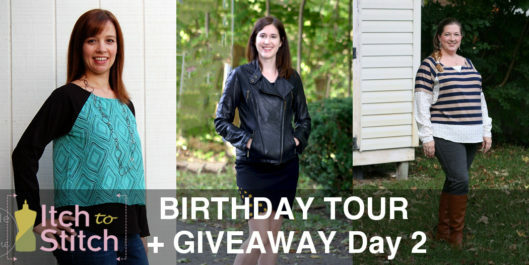 Today I’ve decided to split the post into two, with this one focusing on the blog tour and put the featured designer post and giveaway in another. Lucinda is a Boston-area craft-a-holic obsessed with sewing and knitting, as well as other crafty goodness, and blogs about creating a handmade wardrobe at Sew Wrong. When she’s not sitting at her sewing machine, she can usually be found with her running shoes on or swimming laps at the local pool. Lindy Petal Skirt is Lucinda’s pattern of choice for this occasion. Nicola Hebert of Seaside Notions loves a tasty glass of red wine, scented candles and a quiet evening to curl up with her sewing machine! The Paulina is the perfect fit to cozy up with your sewing machine with some soft leggings and fluffy UGGs!. Check out her hack of the Paulina to see how she modified the pattern to include a Peek-a-boo “V” at the neckline and woven sleeves with a cuff. Did you enter for your chance to win yet? One lucky winner will be chosen to take home fabulous prizes. Learning the basics of sewing with my Grandmother. Probably when I gave a quilt to a friend for her birthday, she knows how much work goes into a quilt so she really loved it. Fondest sewing memory–just two weeks ago–my three year old nephew wanted to help me sew. He sat next to me on the bench and pressed and held down the reverse lever when I told him it was time and when to let go. So cute! my vest memory is when my 10 year old wanted to learn to sew and the first thing she made me was a purse it was really good. I took a sewing class in middle school and we had to master several techniques before we could get a “sewing license” and sew a full garment. My parents thought it was funny but I was proud and hung it in my room. Myfondest memory was when I finished my first garment. It was a denim coat with pockets and loop belt. It took hours to complete but I was so happy when I finished. I hadn’t gotten the hang of fitting yet do it was too small but my friend-girl loved it when I gifted it to get. My fondest sewing memory is sitting next to my mom with my red toy singer sewing machine (who was also sewing on a machine) making a dress for my doll. Hmm, my fondest memory… so hard because there are so many good ones. Probably being able to teach my little friend and watch her creativity blossom and grow. She has such a knack for it and I’m so thankful I got to enable her. I still remember the first skirt I made my mom. Made on my little sewing machine. I was so proud .